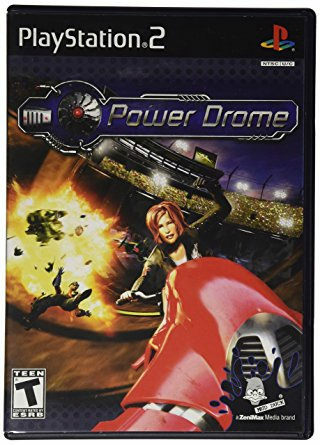 Power Drome is one of those PS2 games that you likely have not heard of before now. If you do know it, then that’s pretty impressive. I got the game because of how the gameplay looked and I definitely am a sucker for futuristic racers. They tend to be a lot of fun and this one is certainly no exception. The single player mode is unrelenting but at least this helps add to the length of the game. The multiplayer is where you will spend the majority of your time though. There are 3 main modes for you to have fun in. Single Race is just like how it sounds. You pick a track and then test your mettle on it. You have multiplayer mode where you use the racers you have unlocked to have fun on all the tracks. Finally, there is the championship. There’s no real plot unless you count the quick level descriptions. You are trying to rise up the ranks as an up and coming racer so you enter many tournaments and even some 1 on 1 showdowns. Surprisingly the showdowns are the easiest ones and since you unlock racers that way, it definitely works for me. You can earn a gold, silver, or bronze medal based on how well you do. The difficulty continues to accelerate more and more as you play through the championship. I beat around half of it with the main character before I had to switch to one of my unlocked fighters. Even then the final tournaments proved to be a little too much when it came down to speed. My opponents were just so much faster than me that it was scary. They would leave me in the dust as soon as the race began. The final stages also had a lot of turns so it was difficult to actually gain any ground on the opponents. You can drift in the game, but I found it hard to do reliably and without crashing so I ended up bumping into the walls either way. If I could turn better then defeating these later levels would be considerably easier. Aside from accelerating and braking, you have two more gameplay additions. You can boost your way through the race by using up some meter. You do get a nice burst of speed, but it’s rather minimal and usually isn’t quite enough to let you get past the opponent. Alternately, you can use your meter to heal your car to prevent yourself from blowing up. This is extremely handy although your speed will take a nosedive temporarily. The graphics look reasonably sharp. The level designs are good and the cars look high tech as they should be. I wouldn’t say that the graphics are anything to write home about, but they are bright and fairly colorful. You can always tell where you are on the track which is crucial. You do move at really high speeds which can make it tough to start turning on time, but they do have constant signs to let you know where you have to stop so it really comes down to your reaction times. I’d say that the soundtrack was reasonably solid. Again, you probably won’t write home about it as there’s nothing amazing about it, but the music selection works well as background noise to the races. It’s certainly not slow music so it won’t force you to slam on the brakes. This game does have some voice acting but it’s mostly just to show off how edgy all of the characters are. Perhaps they aren’t all edgy as I only played as two characters, but as part of their taunts they give the birdy. One guy slams his head on his car repeatedly and the girl shakes her fist at the other racers. I suppose this does seem to take place on more of an underground racing circuit so of course they don’t get along, but it’s almost funny to be doing this during a race. I guess they can drive these incredibly fast machines with one hand. That’s got to take a lot of talent. There is a good amount of replay value to be found here. Unlocking all of the racers of course, but also clearing Career mode. Both should take a considerable amount of time unless you are a master at this genre. Even then you will still have to get used to this game’s gameplay in particular. Then multiplayer also unlocks a huge amount of replay value. Racing with A.I can be fun but it isn’t quite the same as racing against an actual person. Playing this game reminds me of why we need more F Zero titles. GX still ranks as one of the greatest racers out there and the futuristic racing genre is just a lot of fun. I’d say that Wipeout does a better job of capturing F Zero’s essence than Power Drome, but as Drome only features a boost and no items, the actual gameplay is a little more similar. You can even boost ram into other cars to try and take them down for the count. Unfortunately it isn’t permanent though. I prefer when you are only given one life in a race. It increases the stakes and really reminds you not to get hit. It’s why F Zero is one of the only racers where I would actively target the other racers as I tried to take them out of commission. Overall, Power Drome is a fun game. It does have a little more personality than other racing games with the characters being distinct and at least having some kind of career mode. The difficulty is a lot higher than you might expect, but with enough practice I’m sure you will be able to clear the game. At the very least, you will want to do it to unlock the extremely fast racer. If this game got a sequel with more of an actual plot behind it, then I’d be all for it. That would definitely have potential. This entry was posted in 7 Star Games, Game Reviews, Games, Reviews and tagged Game Review, Playstation, Power Drome, PS2, Racing, Review, Sci-Fi, Sony, Video Game Review by dreager1. Bookmark the permalink.